It's been a long time since I've been around these parts. I've been missing writing, and keeping track of all that we're up to around the house, and with our precious little peanut. I decided I could use a little inspiration, and this space could use a little overhaul. So, with my first post of the new year, I introduce you to my new blog...Seeking Sparkle. It's taken a long time for me to get to this place in my life, a happily married, home-owning, working mom of a toddler. It was a bumpy road that dulled my spirit. But I made it. I'm here. Living and enjoying my life, and feeling like myself for the first time in a long while. I sparkle again! And so, I decided to revamp this space, to share things that make life sparkle—from improvements to our home that make it look beautiful and function better, and adventures in parenting that make my heart sing on a daily basis, to art & design that fuels my creative soul. I'm trying not to over think this, as I have a tendency to do, so I'm jumping right in. It doesn't look perfect. There's no fancy logo or background...yet. I don't want to put too much pressure on myself, or to get hung up on having the perfect photography to illustrate what I have to say. I just want to write again, to seek out sparkle, and to share it. 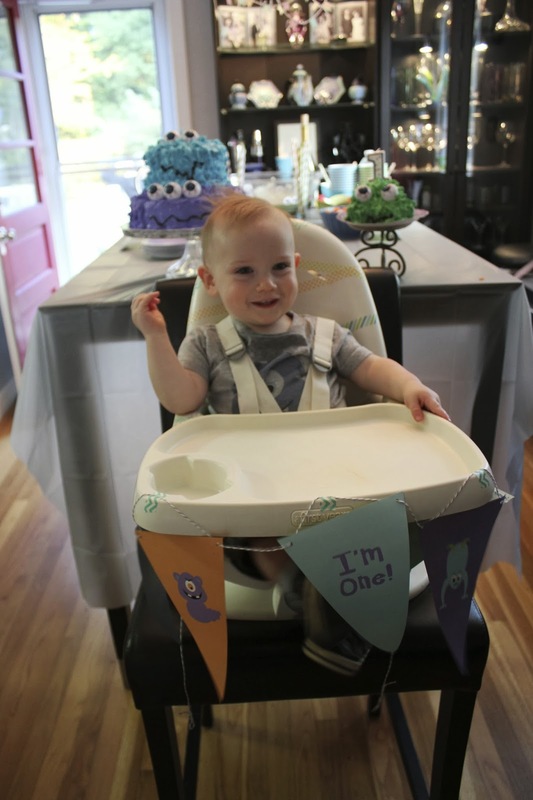 And what better place to start than with a recap of Leo's first birthday party this past October?! I have always loved planning parties. And every good party begins with a great invitation, right? I put my design skills to work and created a gang of silly monster characters to adorn the invites, and the party decor as well. Above, is the front of the invite, with the specifics cropped off. Below, is the back. I got them printed at Zazzle. a site where I have sold my designs, and printed cards, etc. for years. We actually ended up having two parties. One for family, and one for friends. Our house is not large, and there was just no way to fit everyone all at once. Some people choose to rent space so that they can fit all of their guests. 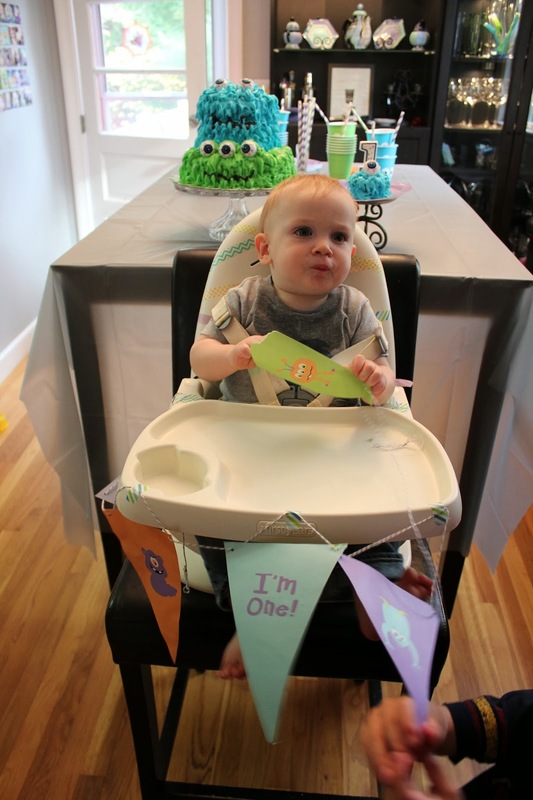 But we had been working so hard on our basement family room remodel (several more posts need to come on that), so we really wanted to have the party(ies) at home. 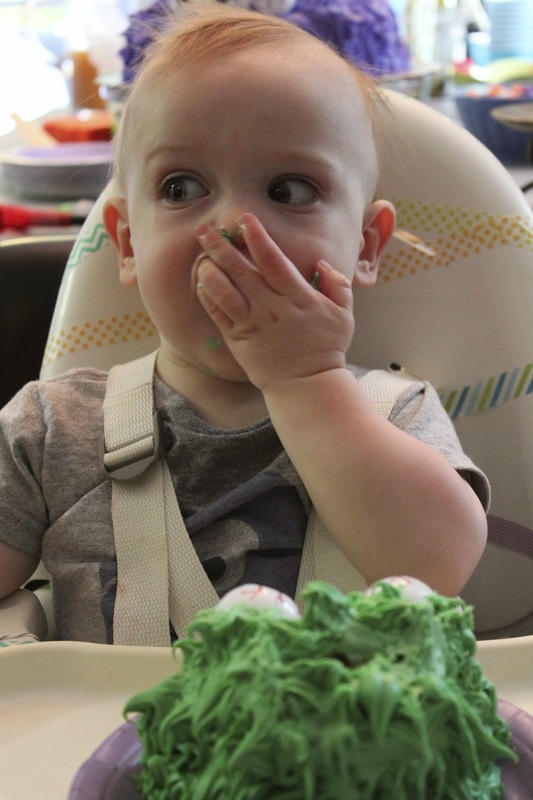 An important part of any birthday party, but especially a first, is the cake, right? I have only made a few layer cakes in my life...inspired by a wedding gift from my aunt, a crystal cake platter. She told me that my Gram used to serve birthday cakes on one just like it. And so began my journey into round layer cakes. 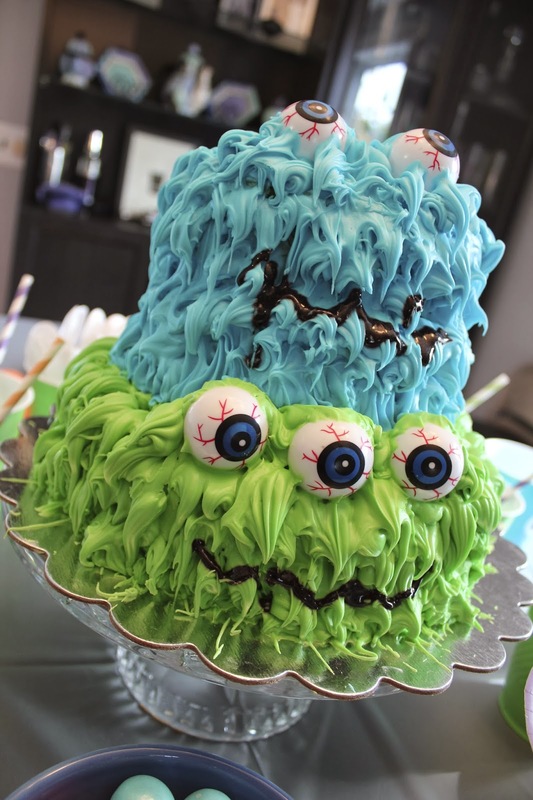 The good news about a Monster Bash, is that a monster cake can be a bit messy, and no one will notice. 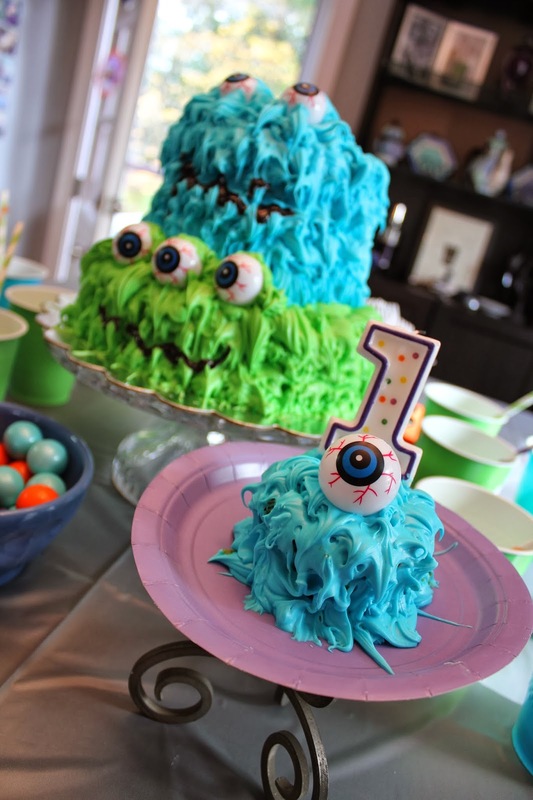 So, I decided to be brave, and take on not only a layer cake, but a tiered layer cake, as well as a separate smash cake for the birthday boy to enjoy. I searched for inspiration on Pinterest, and came up with my design. I bought some high quality icing dyes to get the saturated colors I was looking for. The eyes were plastic party favors. I just piped the frosting on in dollop after dollop, and it ended up looking like a stack of hairy monsters. But the monsters weren't just colorful on the outside. 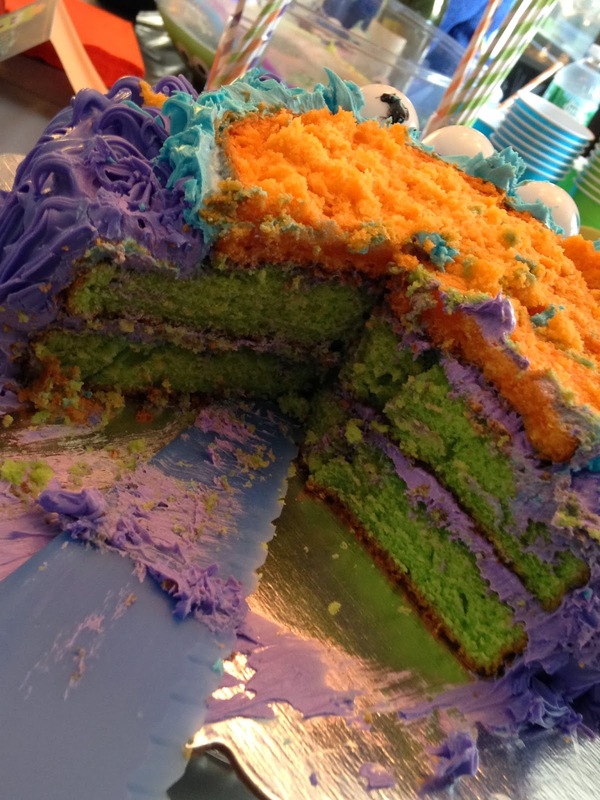 I had fun dying the cakes as well. 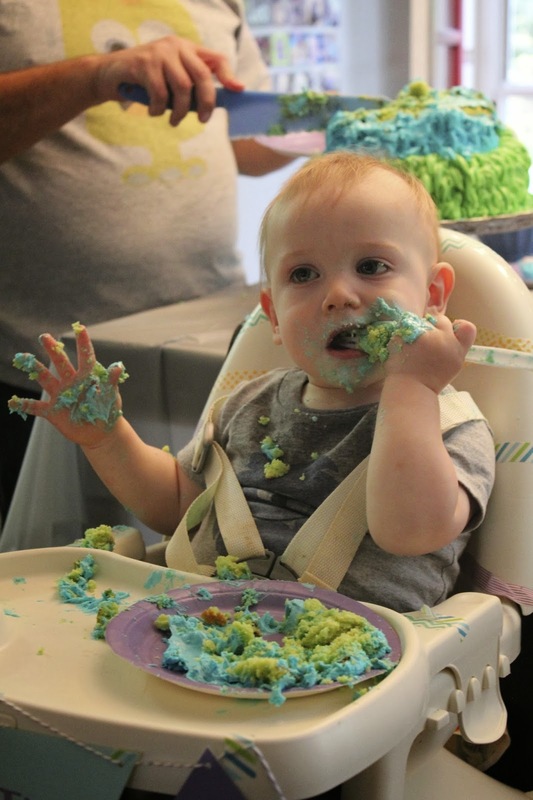 Leo's smash cake was created from sticking a few cupcakes together in a pile of frosting. The party was in the afternoon, so we kept the food simple, just some snacks and drinks, and of course, the cake. The theme was carried through all of it. I bought a cheap plastic bowl from a party store to use for our "Bug Juice" punch. (Lemon/lime soda, rainbow sherbet and a little green food coloring). I used stickers in two colors to create eye balls looking into and out of the bowl. All the stickers were on the outside of the bowl so they wouldn't get wet. I started with the small black circle, then the larger white, then another small black on top. This made it seem like the eyes were looking both into and out of the bowl. We threw in some creepy crawlies from the dollar section at Target. They look like something a monster might snack on, right? 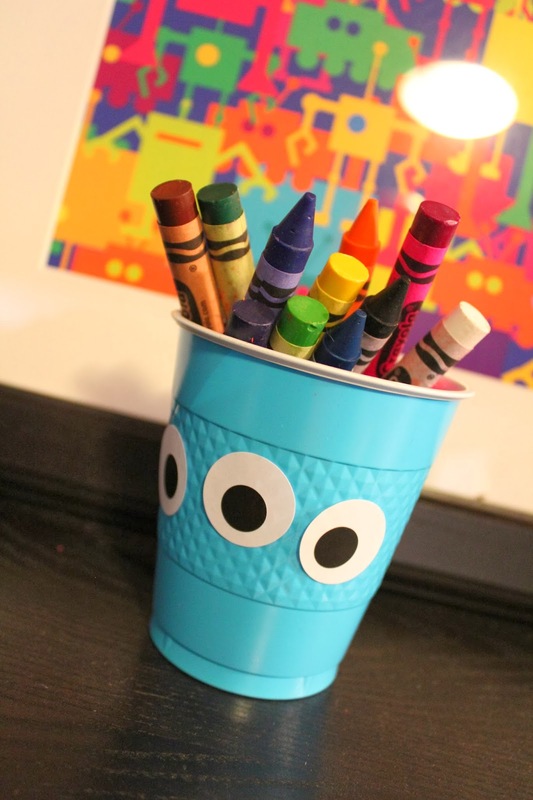 I used the same stickers to create eyes on the cups, which were accented with colorful paper straws, that stuck out like antenna. 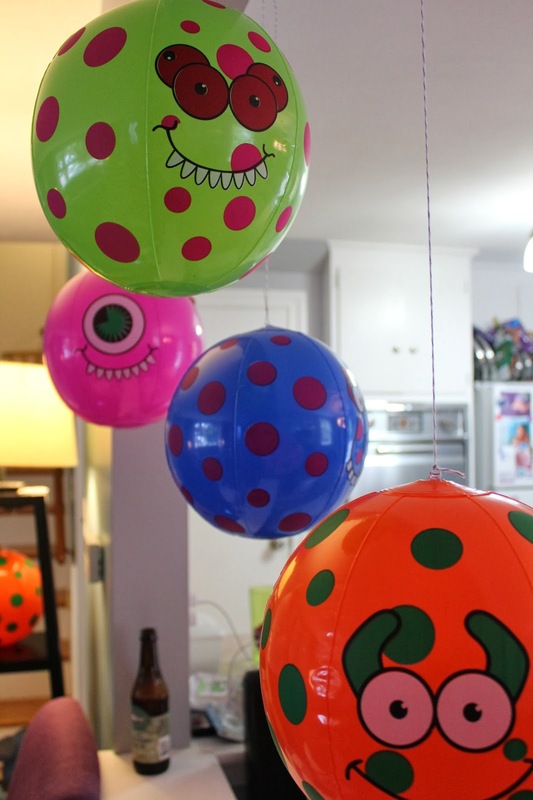 I found these monster squirt balls on Amazon, which were perfect for favors. And these monster beach balls, which we hung from the ceiling like balloons. I also have a new obsession with washi tape. I bought a few rolls that complimented the colors of my monsters and made a few of these garlands by looping the tape around baker's twine. I also used the tape to hang up my collection of weekly instagram photos on a blank spot on the dining room wall. (I'll confess, they are still hanging there, three months later!) You can see that I also mixed in my five monster characters to fill out the space, and make a complete grid. 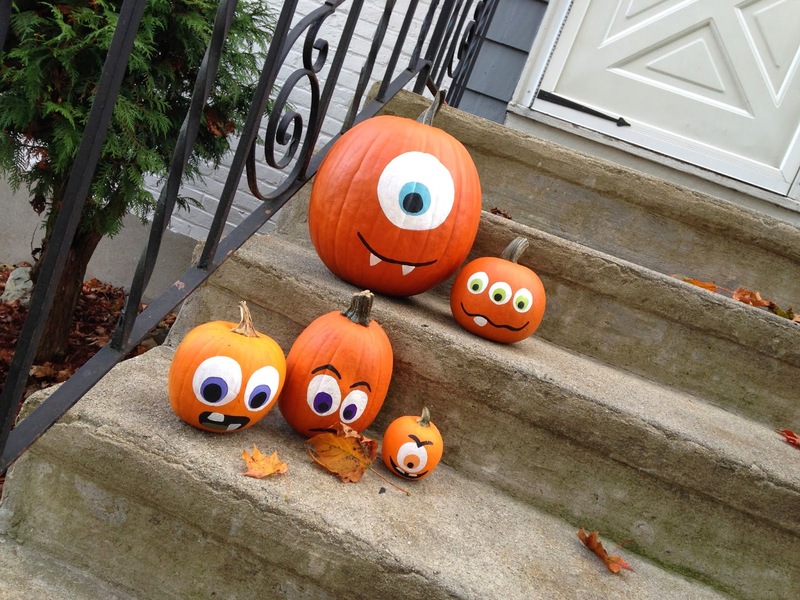 Since Leo's birthday is in October, and monsters are a Halloween-ish theme, I decided that our pumpkins should get into the spirit of the party as well. I painted each one with the same faces as the five monster characters. Every birthday boy needs something special to wear too. 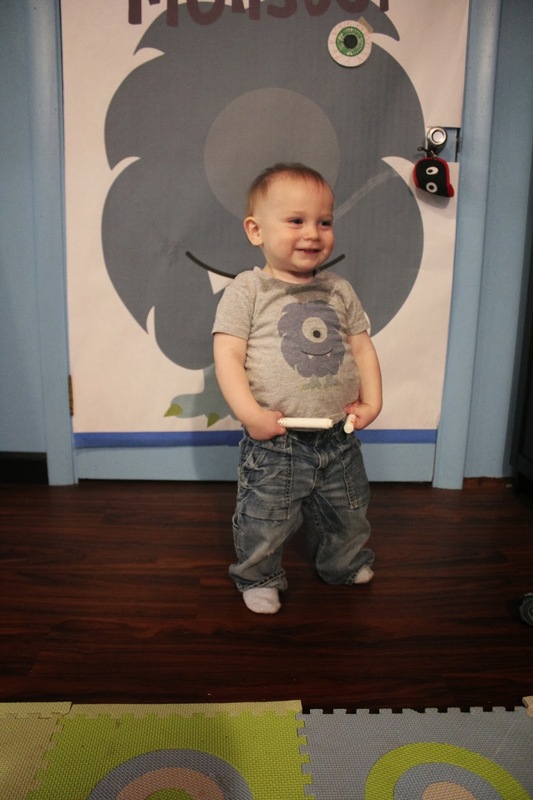 So, I used Zazzle again to make a T-shirt for Leo to wear. It was practically too small before he even got to wear it. (hint: Zazzle clothing runs small!) But, I still think he wore it pretty darn well. The first party, with family, was mostly grown-ups, but we still wanted to have some party games. 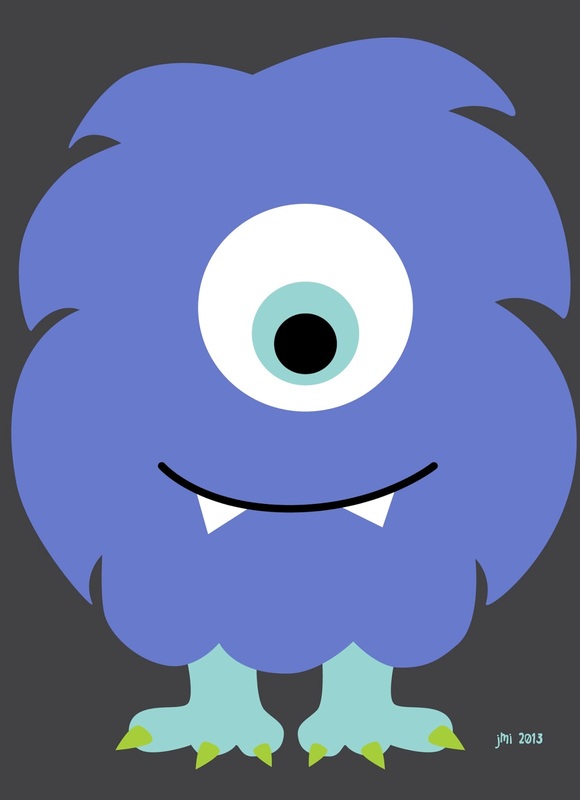 We decided to create a March Madness style bracket to determine the best monster. Everyone got to vote for each pairing...with the final match up being Frankenstein vs. Oscar the Grouch. Frank was the winner with this crowd....and with Greg. 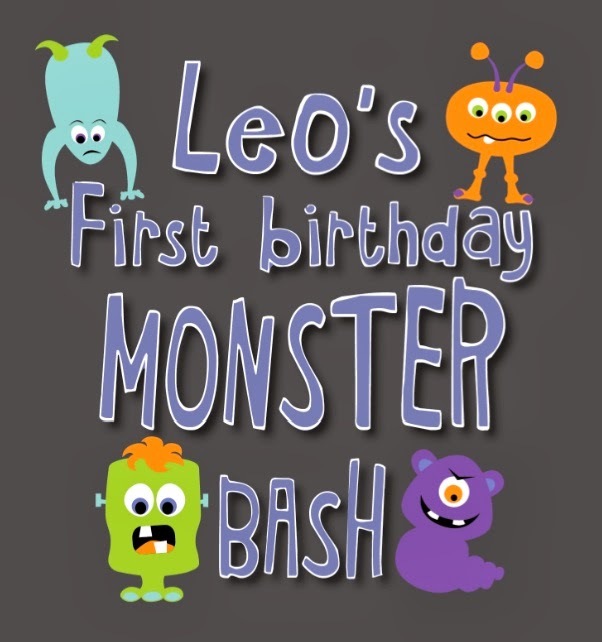 He got a Monster Bash T-shirt too! 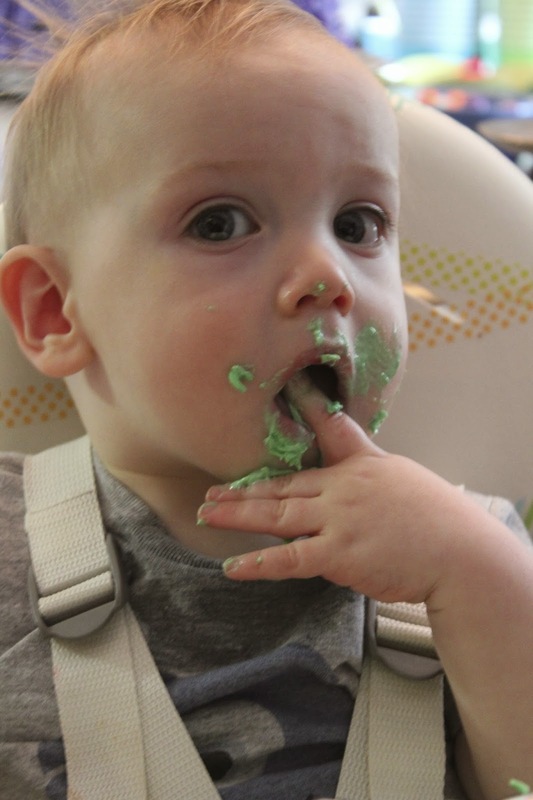 Finally, it was time for the birthday boy to take his seat and have his first taste of cake. Turns out, he liked it! A week later, it was time to do it all again. Yes, there were two more cakes. To keep it interesting, I used a different combination of colors the second time around. The party for our friends took place more in the basement family room, since there were many more children in attendance. We also had more monster snacks this time around. We made the same "Bug Juice" punch. There were "Monster Eyeballs" made out of deviled eggs with green colored filling, and black olive pupils. "Monster Mouths" were slices of apple held together with peanut butter, and almond slices for teeth. Platters of fruits and veggies were arranged as monster faces. At this party, we played "Monster Madness" again. 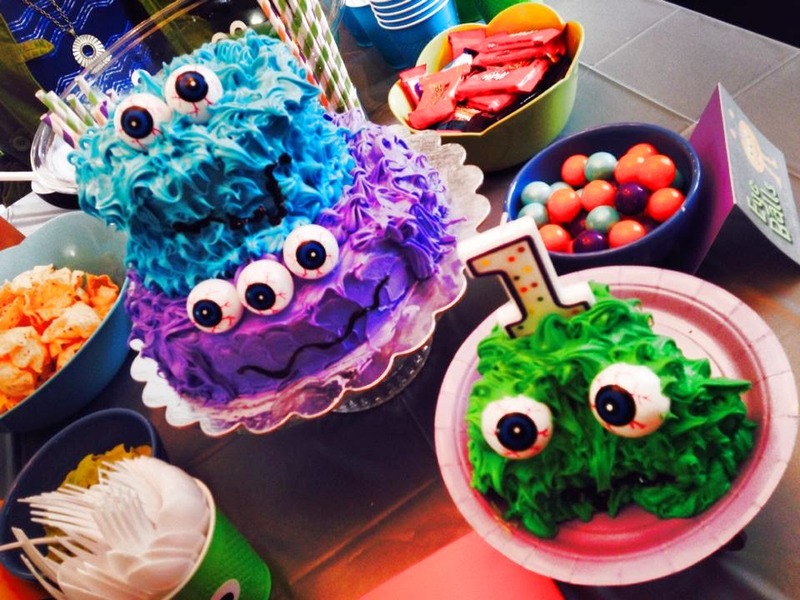 This time, Cookie Monster was the winner. We had some additional games as well. "Feed Frank" was a bean bag toss challenge. 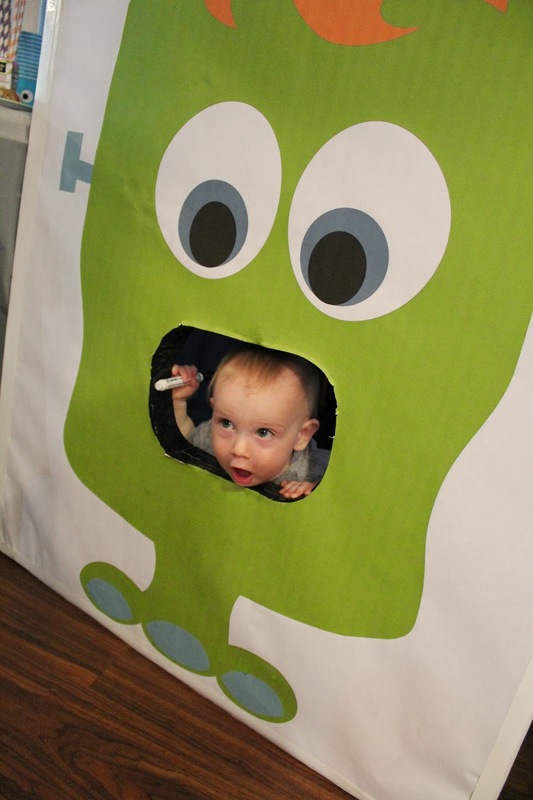 For "Pin the Eye on the Monster," the kids were invited to color their own eyeball before pining it on the target. I also found color your own monster face lunch bags in the dollar section of Target, and had those set up for decorating as well. 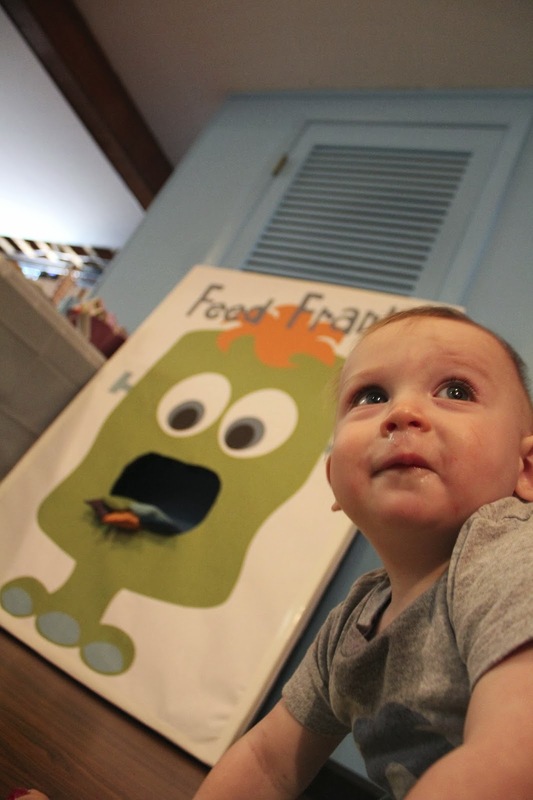 It turned out that "Feed Frank" offered more entertainment than we anticipated! And finally, it was time for cake once more. 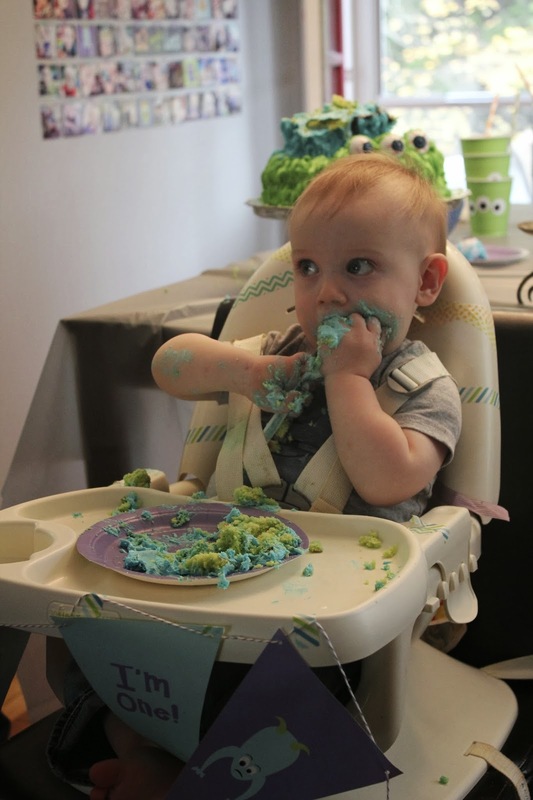 Thankfully, Leo did not come to expect his own cake every weekend, but he has become quite the cookie monster over the holidays! 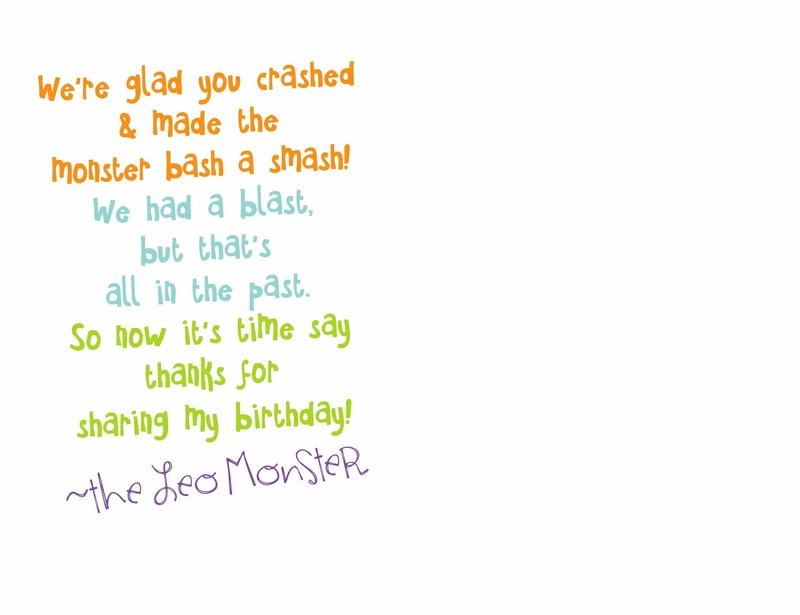 So there you have it folks, two wonderful Monster Bashes celebrating our most magical little Leo. I think it's safe to say that an amazing time was had by all...both times. But before I could let the monsters go, there was one more project to take case of...the thank you notes. Again, I used Zazzle to print up some post cards, with this little poem Greg wrote. Thanks! I keep hoping to expand my Zazzle designs...it's just a matter of finding the time.